nevard_110825_BQ_fascia_IMG_0961_WEB, a photo by nevardmedia on Flickr. 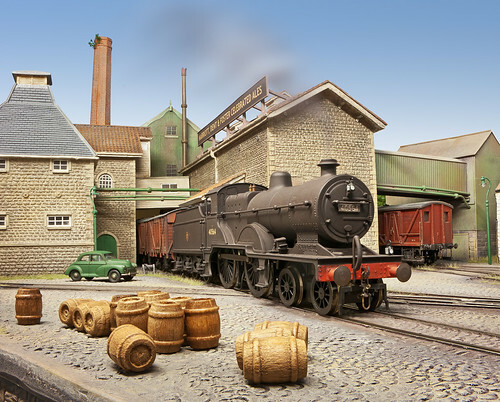 We spend many many hours making our locos, wagons, carriages, track, buildings and scenery look magnificent for that big exhibition. Then, far many too of us are happy to put up with a grotty rather badly painted or home made sticky backed plastic lettering to display the layout name to attract the crowds at exhibitions. This is a real shame, because a layout is only ever as good as the worst bit, so what could have been tip top suddenly becomes very ordinary. We show off our layouts to paying public who are well aware of the high standards of presentation outside toy-train-land at trade shows the high street etc. Instead too often they get badly presented layouts that shout out 'amateur' in a dusty, squeaky adenoidal voice. Sadly this does nothing to promote the hobby to people that don’t spend their whole life on their own inside dusty, dark damp sheds. These days there is no excuse for bad presentation, especially for those layouts that get out on the road. Your traditional sign writer has been mostly replaced by the boys with Macs and huge printers, who will print anything on to anything for a palm full of sovereigns or the price of a OO gauge loco. And let’s face it; we all have far too many locos, so the £45 spent on something like the ready-to-attach 4ft x 6 inch name board seen above is money far better spent. No skill is required other than the ability to knock up a quick sketch of what’s required to give to your local print shop and then negotiate a discount for cash if you have a cheeky face. As already mentioned, modern signwriter-printer-graphics workshops will print anything onto anything , so I asked then whether they be able to print my next home-created photo backscene onto sticky backed plastic – their reply was ‘of course’, so now there is no need for a wrinkly and creased photographic paper backscene any more - just peel and stick. ‘Brewhouse Quay’ seen above, is 9cm high laser cut lettering utilising ‘Stencil’ type face bonded onto a tough high density plastic display board. They even cut it out to my precise dimensions so it it is ready to fix to the proscenium arch with high strength double sided tape. I think you’ll agree it looks better than the usual blobby Tippex painted on to hardboard – though of course those guys do have more locos than me! I used Gidden Place www.giddenplace.com/ in Guildford for this example – though every town will have a similar shop. nevard_110829_PHD-mill-gate_IMG_1029_WEB, a photo by nevardmedia on Flickr. A PH Design 'Mill Gate' from etched brass, seen here guarding the right hand exit on Brewhouse Quay. Pete's designs are wonderfully delicate in design and execution, so quite a bit of care was needed when painting it to avoid distorting the delicate brass etch. The etching is supplied in 2 halves, and the idea is that one solders the two together for extra strength. The problem I had was that due to the very fine nature of the etching I found it impossible to get 100 contact so decided just to use the one half. The bonus of this is that one gets double the number of gates! If the owner requires the gates to operate, it would be easy enough to add a verticle and horizonal strengtheners from some spare brass strip of wire. Painting was a doddle; 2 coats of Halfords red primer followed by a pale Hunbrol chrome green was dabbed on randomly by brush making sure that some of the red primer still shows throug to represent rust. I then finished off with a very light dusting Halfords grey primer to add further sun-bleaching and patina. I have just found an old 50ft spool of standard 8mm Agfachrome of Sentinel 'Mendip' arriving and shunting a brake van along the Marriott, Dent & Foster Brewery sidings at Brewhouse Quay. I'm currently suffering audio problems with this clip - select 240p if you cannot hear anything! nevard_110823_BQ_IMG_0960_WEB, a photo by nevardmedia on Flickr. Part bull: 40564 was one of the very last of the elegant ex-Midland Class 2P 4-4-0 locomotives to run on the 'The Dorset', it being finally withdrawn in 1962. 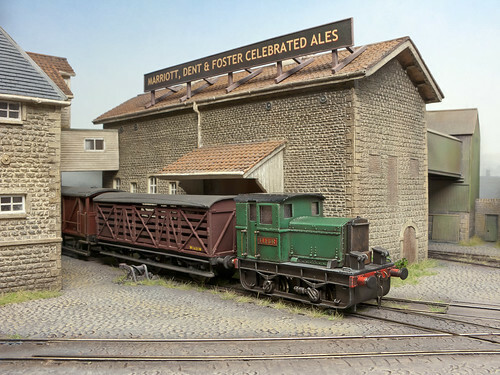 In latter years, it would be frequently used on the 11.30 'Beer Express' from the Marriott, Dent and Foster Brewery in Bath down to Bournemouth West. On a bright morning in 1960, the train is captured departing Brewhouse Quay for its holiday resort destination freshly loaded with bottled 'Bright Bath Bitter Ale' for thirsty holiday makers. The train would initially trip the mile or so into Bath Green Park goods, where it would be run around in preparation for its journey south over the Mendips. Truth: I've had this Hornby loco for around 10 years, it being a nice Christmas pressie from the trouble and strife. The only work on it has been a blast with Halfords matt black, a renumber and light weathering. It sadly has a tender drive unit, which is fine on a roundy-roundy layout, but quite inadequate for any operation that requires slow controlled smooth running. It doesn't help that the tender drive wobbles and that more often than not, the loco wheels stop going around or rotate at a slower speed than the engine! I gather this ex-Mainline model from the 1980's is to be re-released in due course from Hornby with LOCO-DRIVE - if that does come to fruition buying a new one for the chassis and tender could be a cheaper option than fitting a Comet chassis. So, for the meantime the loco only sees use in front of the camera for static shots like this that require nothing to actually move! Oh yes, and it's raining outside again! Cheery pic for a dull old day! nevard_110822_BQ_IMG_0942_WEB, a photo by nevardmedia on Flickr. Looking across the Avon towards the Marriott, Dent & Foster Brewery in Bath, Johnson 1P 0-4-4 No. 58086 is spotted shunting on what would appear to be a lovely summer's day. Note in the distance the little privately owned Sentinel 'Mendip' which can be seen resting in front of the grainstore. Reality; in the UK today it's the height of summer supposedly, but as most are no doubt aware it's a dull, wet old day and more like something we would expect in the middle of November! To slightly balance reality, here is a rose-tinted reminder of how all summers used to be - well, as we like to remember them anyway! Model; the quayside has been embellished with a little more undergrowth after seeing something similar week before last during a waterside afternoon walk on one of the few sunny days we've enjoyed this summer. The bright-ish green is more of a feature of my RAW conversion than the actual colour - it was rather late in the day when I sorted out this photo! And (yawn) again for all those sceptics who think that all photography these days is 'Photoshop', they will be disappointed to know that the only 'addition' is the light waft of steam as 58086 blows off. 58086 photographs really well from this angle, its elegant lines suiting side profile views. This is my oldest loco in regular use, it being the first 'proper kit' I built as a teenager. Interestingly, although it's from brass, quite a bit of superglue was used in its construction, and surprisingly almost 30 years on none of those bits have failed which very much bucks what the heavy-rimmed bespectacled tweed clad 'experts' with yellow flux-stained fingers told me all those year ago! nevard_110821_BQ_IMG_0923_WEB, a photo by nevardmedia on Flickr. Here's an angle you won't normally be able to see unless you peer over the end of Brewhouse Quay behind the lighting rig. From this angle, the track layout can be observed to full effect including the wagon turntable which links to a siding that runs out right through the backscene to the other side to allow a little fun swapping wagons around. 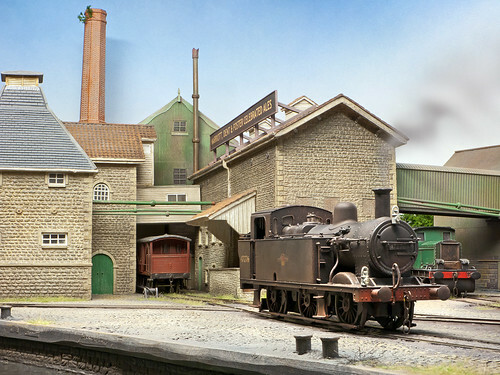 Very shortly, the line in the centre foreground will be extended towards the photographer's groin, between 2 buildings out of shot and through the backscene to another small fiddle yard which has yet to be constructed. 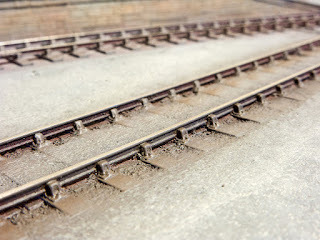 The 2 lines that disappear behind the brewery buildings run through to a hidden sector plate which links to further sidings behind the backscene. Hopefully all the above will provide a margin of excitement and entertainment that will keep the poor operator amused for maybe 4 or 5 minutes before going terminally mad from the shear boredom of pushing wagons to and fro in a random manner. Clever people would think of some kind of shunting puzzle to make some purpose, but with most viewers only watching a layout for a couple of minutes maximum (the gold fish bowl theory), and operational-apathy on behalf of muggins here, such excessive organisational indulgence could be wasted or maybe not? nevard_110821_BQ_IMG_0878, a photo by nevardmedia on Flickr. It's brew up time at Brewhouse Quay for Sentinel 'Mendip', ex-L&YR 'Pug' 51202, Planet 4WD 'Fleur' and 'Radstock' an Austerity tank recently purchased from the National Coal Board. The Ford Popular wasn't parked that well from a photographic point of view, but now 55 years on it adds to the scene. The Sentinel is a Model Rail/Dapol Sentinel which has had a change of identity, having been detailed up and is now in private ownership. The Pug a detailed, renumbered and repainted Hornby model - it runs a dream too which is much to my surprise - widening out the back to backs to 14.7mm may have helped here. The Ford Popular in the forground is from Oxford Diecast and has been reglazed with Krystal Kleer liquid glazing, muckied up and finished off with Testor's Dullcote. The little green diesel is a Planet from a Roxey Mouldings kit, and finally the Austerity a fiddled with Hornby 'Harry'. Taken on a little Canon G9 shooting RAW under the layout's built in flu-lighting, 7 exposures were stacked and processed with Helicon Focus to increase the depth of field to match what the eye sees. The only CGI is the faint puff of smoke from the engines - which I like so there! The backscene is nice and high so, no need to mess about there. It depicts one of the later electric designs with a less ornate swan neck from the 1950's with a rotary timer from a design dating back to the 1920's. To get really in to street-light-nerdism, the lantern is my rather crude interpretation of an 'ESLA Bi-Multi Group "AL" Two-Way 165°' made from some brass tube filed in half and mangled a bit with some small pliers. The faded mid-green, after painting with Humbrol 101 I then dust over a little Halfords grey primer from a couple of feet away to get the effect of faded paint. 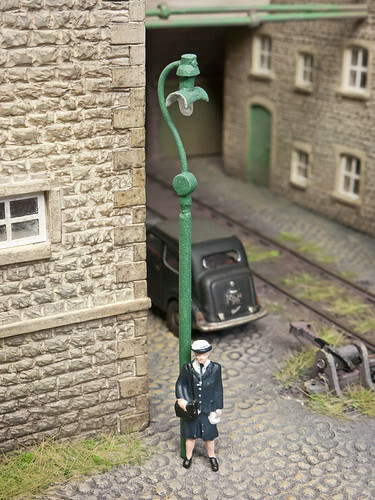 The light is seen here freshly planted on a corner of Brewhouse Quay and could do with a few weeds around the base. Betty Stoggs of Her Majesty's Customs and Excise as usual was keen to pose for the camera. nevard_110817_BQ_IMG_0835_WEB, a photo by nevardmedia on Flickr. 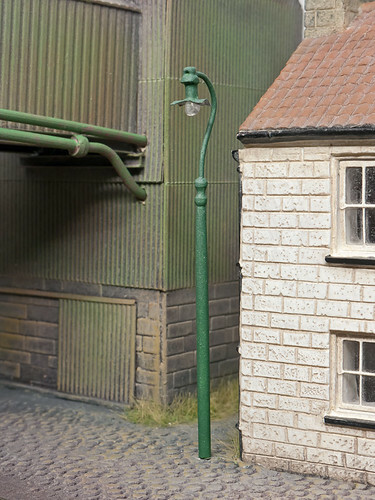 A spare hour yesterday afternoon produced this scratch-built art deco era electric street light based on ones seen in Weybridge Surrey. The underside of reflector on the real lamp would have a mosaic of mirror glass like on a glitter ball - obviously too small to model. Looking at old photographs in the Weybridge and Walton on Thames, area they appear all over the place in 1955 Francis Frith photographs, and I remember seeing the tungsten versions as modelled here within the last 10 years locally. Now they have modern SOX sodium units in place, but thankfully still have the swan neck and are painted mid-green. I'm guessing that before electric conversion (in the 1920/30's?) they could have been gas, and would have probably featured the familiar cross bar for the lighting up man to rest his ladder on. The problem now is that I want to make some more, a simple enough job, the base is carved plastic rod, the neck brass wire, the reflector aluminium from a beer can, and the bulb a little piece of clear styrene from the sprue of some window glazing. nevard_110817_BQ_IMG_0829_CLAG_WEB, a photo by nevardmedia on Flickr. Two blog posts in one day! This is only a little photo for bedtime, so nothing too wordy. The loco is a Bachmann 'Jinty' re-numbered as Bath's 47276 which spent much of its later life shunting and banking trains around Bath and the nearby Radstock area. It briefly had a moment of fame when it appeared in 'The Wrong Box' starring Peter Cook, Dudley Moore and Michael Caine and was painted green for the station scenes shot at Bath Green Park Station in September 1965.
nevard_110817_BQ_IMG_0830_WEB, a photo by nevardmedia on Flickr. A new building has finally appeared at the rear just in front of the backscene on Brewhouse Quay. It is half low-relief and is constructed with a foam board inner clad is various textured plastics for Evergreen and Slaters. Breweries are all about turning water, hops and malt into alcoholic liquor, and to achieve this much is the way of water is pumped all around the place courtesy of a Knightwing (thx PP) piping kit which features different pipe gauges, taps, bends and brackets. nevard_110816_BQ_IMG_0812_WEB, a photo by nevardmedia on Flickr. 'Marriott, Dent & Foster Celebrated Ales' is now displayed on the roof of one of the brewery buildings at Brewhouse Quay. Various serif type faces were also tried, but the real Messrs Dent & Foster chose the sans serif 'Trebuchet' type face for that immediate post-war look. It was created with Photoshop and coloured cream with a maroon drop shadow, it was then printed out at my local 1 hour lab (my colour printer inks have dried up!) and bonded onto a plastic card frame. The loco is a Roxey Mouldings kit of a Planet 4WD, the old milk van is from a Kays kit and is at least 40 years old. 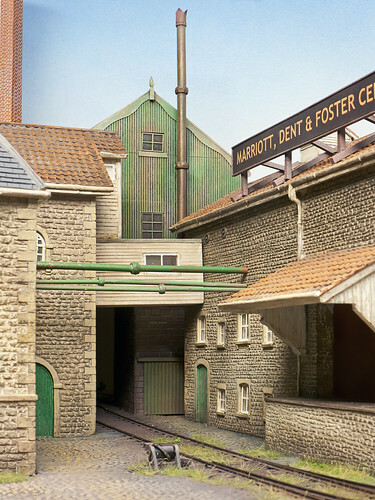 See Brewhouse Quay at Model Rail Live 17 & 18 September 2011 www.modelraillive.co.uk where you'll be able to meet the real 'Marriott, Dent & Foster'. nevard_110606_MIDFORD_7F_DSC_2443_web, a photo by nevardmedia on Flickr. S&DJR 7F No. 53809 passes the Anchor and Hope at Midford with an Evercreech to Bath goods train. ﻿This shot a few might recognise from a black & white BIG PICTURE in the August issue of Model Rail which was dedicated to various aspects of the Somerset & Dorset Joint Railway. It is of course a spoof and not pretending to be anything more, for trains have not passed through here for 45 years. The loco a model from Bachmann has been unashamedly super-imposed onto a present day photo taken at this delighful spot just south of Bath. On a light-hearted note, really serious railway enthusiasts tend to be a 'very matter of fact' brigade with a glass that is nearly always half empty, and a few hot under the collar readers since publication have pointed out that the double yellow lines would not have been around in 1959, and another commenting on some period technicality with the telegraph pole (?). To be really pedantic of course, back in the days of steam the pub and viaduct were not covered in Ivy, and the pub sign to the far left used to hang from the wrought iron bracket seen protruding from the pub wall top right. In those days it was a Courage pub rather than a freehouse as it is now. The 1960's sports car was however really there, and would have probably left the factory when steam still ruled supreme on Britain's railways - with hindsight though, I wish I'd grabbed the car a little closer to camera, but I imagine the owner's present day attire and lack of period tweed would probably add additional heat to an already baking red-hot raw collar. Of course Photoshop and a degree of skill might be able to address such, but that is not really the point of a photograph which is simply about trying to imagine what it would be like if trains ever run through Midford again with preserved 53809. Computer altering the image to such a degree to address the onslaught of time would simply turn it into an electronic painting and be rather pointless, as I might just as well have published a period photograph from the era. So, moving on from 'glass half empty-ism' to a fully charged fresh foaming happy pint; maybe I should do a version with a FGW class 153 DMU or Virgin Voyager? nevard_110812_cementQ_IMG_0716_WEB, a photo by nevardmedia on Flickr. For the photo here of a Ruston Bucyrus I'm working on for Model Rail mag I poured a pile of sand onto the watery bit that ran until very recently along the front of Cement Quay Old Gravel Wharf. I was so taken with the look that I now want to build a small gravel pit layout. 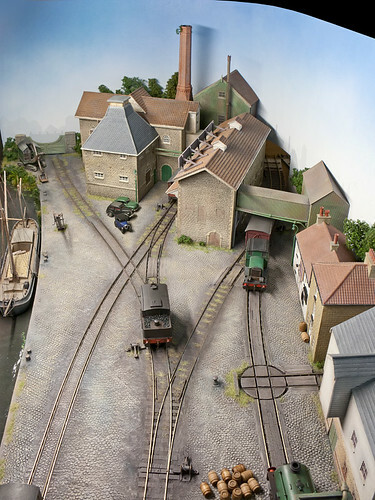 I already have enough model railways so getting planning permission would be almost impossible, so instead I have decided to reclaim some the wharf area as seen above. Here we see the intital work using some 5mm foamboard to form the sub-structure of the gravel pit which will feature a spoil heaps and a large pile of gravel piled up to dry before transfering to rail. 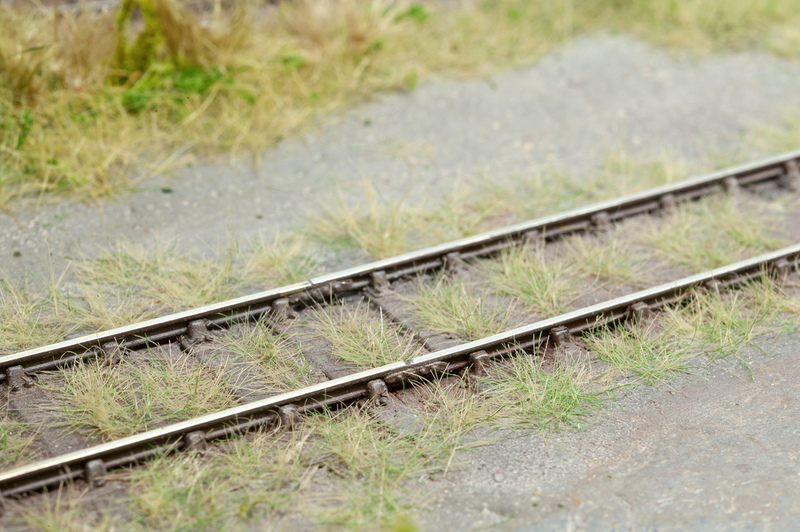 I might even include a little section of narrow gauge railway and another aerial conveyor. nevard_110812_BQ_IMG_0721_WEB, a photo by nevardmedia on Flickr. Wharf-side vegetation at Brewhouse Quay. 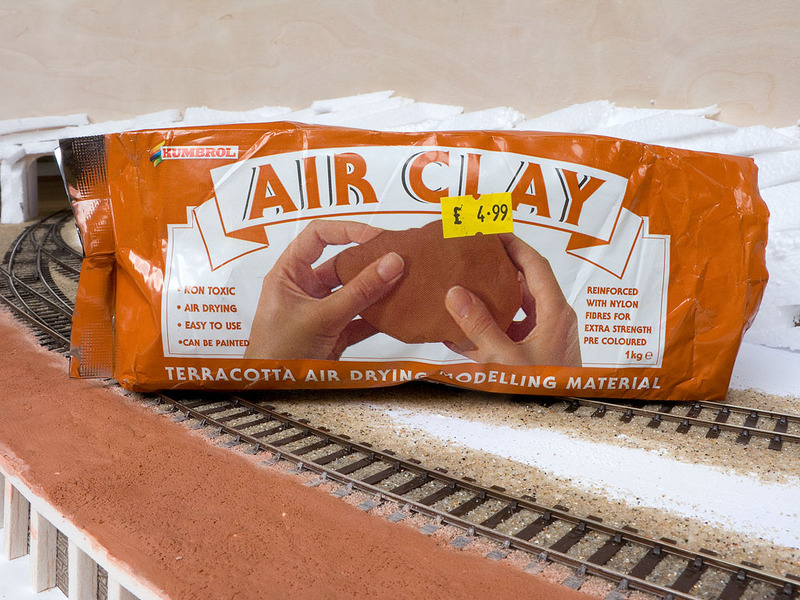 ﻿ We've never had it so good when it comes to model railway scenery products, and many modellers new to the hobby are likely to think that they HAVE to use bespoke products from the plethora of specialist suppliers that have appeared onto the market over the last few years eager to charm you free of your hard earned cash. That's business and there is nothing wrong with that, with some of the products being quite superb, but we must not forget that with a little imagination there other options using inexpensive ready available materials from the local DIY store or even the garden. 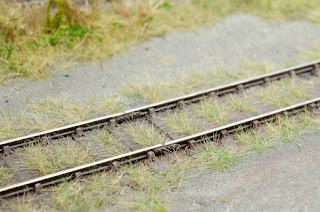 The leafy growth is the only model railway scenic item, it being dyed sawdust over sea-moss. The water is PVA over grey paint, though one could use and expensive resin 'water'. The water lily leaves are blobs of green paint over the PVA base, encapsulated under layer of clear gloss varnish. The grass/reeds are traditional plumbers hemp, search Ebay if your pumbers merchant doesn't stock it any more (updated: B&Q stocks it - thanks Mr Hand). You could cut up and old doormat or paint brush instead. The straggelly green bits are fresh moss from the garden, given a good soaking in cheap hairspray to preserve it. All that's needed is to paint the tips mauve to give the effect of flowering buddleia maybe? nevard_110804_bucyrus_IMG_0705, a photo by nevardmedia on Flickr. The model: Sentinel 'Mendip' poses with a single wagon next to a Ruston Bucyrus 19 'front shovel' on Cement Quay Old Gravel Wharf (try saying that quickly after 5 pints). The foreground is in fact a wharf, but for bit of fun you can instead see temporary big pile of beach sand. The Ruston Bucyrus is a fettled with Corgi Trackside model and will be the subject of a 'Workbench' in the popular press shortly. I'm only showing its ugly side because most of the interesting stuff is on the pretty side and I don't want to give too much away at this stage. 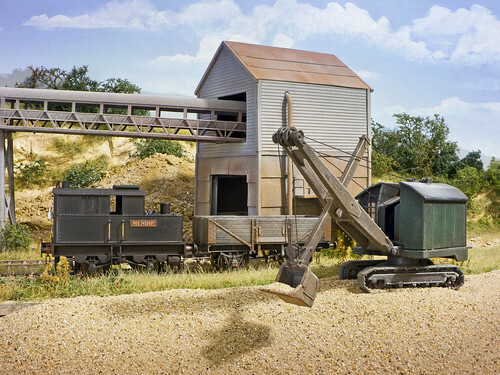 Since more or less completing the Bucyrus seen here, I'd quite like to build a gravel pit layout, but with current space restrictions there is no way I'll be granted planning permission by the domestic authorities. So instead there will be a bit of land-reclaiming by turning some of the water along in front of the current wharf into a gravel pit - see here. I have a spare Walthers Cornerstone aerial conveyor too, so it will consist of gravel dumps to allow for drying prior to loading into wagons. 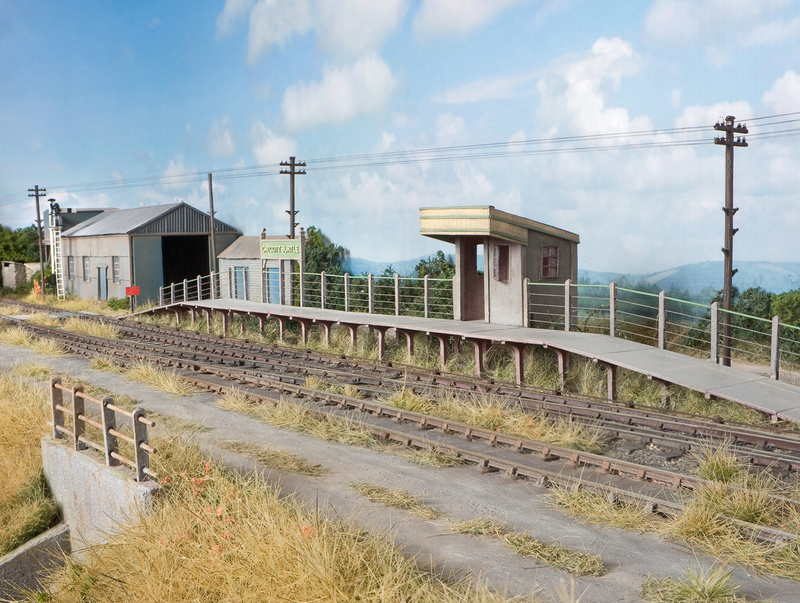 I'm tempted to add a little narrow gauge tramway coming through from the rear too - who knows what will happen, so much more fun! Photography: Rather than use studio lighting, for convenience this shot was taken under a single domestic light bulb hanging from the ceiling with a 4 second exposure. Digital photography especially when shooting RAW allows succesful results in the sort of lighting that would never have worked well with colour film without a great deal of trial and error correcting and filtering to compensate for the warm colour temperature which is probably only around 1800 kelvin; and that's before we even get to reciprocity failure! nevard_110709_cars_DSC_2811_WEB, a photo by nevardmedia on Flickr. 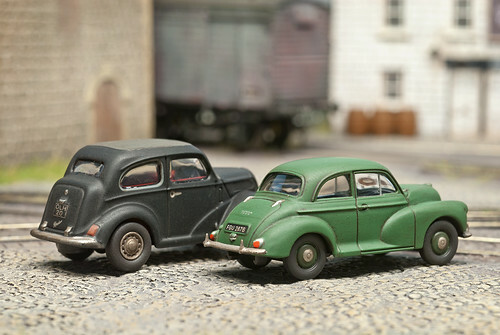 We all love those ready-to-push diecast model cars that can be bought for the price of a posh pint (well in Surrey anyway!). Whilst they are probably better than what can be made from a white metal kit costing 4 or 5 times as much, everybody else down the railway club will own a whole set of cars identical to yours. 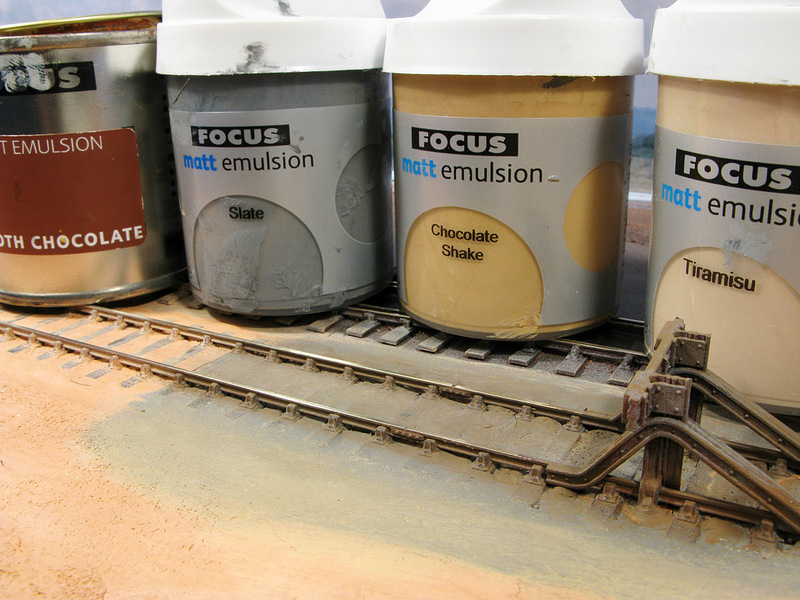 Wash over the body with a brown/grey paint mix (any old paint, I like acrylic and emulsion). Dab off, leaving just enough pigment in the recesses, the amount depending whether you're going for banger or beauty. Remember to treat the wheels too. Reassemble temporarily without the glazing. Blast over with some Testors Dullcote aerosol matt varnish - Google for a supplier. Once dry, dismantle and reassemble with the glazing. I didn't like the glazing on the left had car, a Ford Popular because it was set far too deep inside the car so I discarded it and used Krystal Kleer Glazing fluid instead. Add a dab of super glue where the drilled rivet heads were to hold the car together. 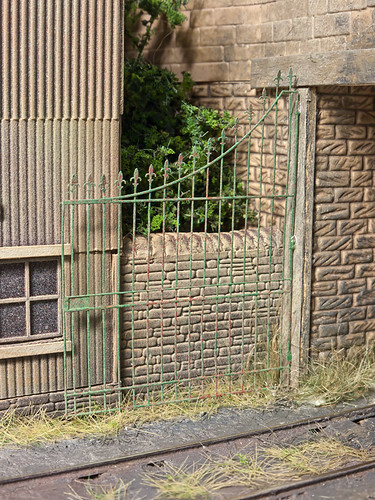 Place on your layout in a parked pose - unless of course you add a miniature driver, in which case queue it at a level crossing or traffic lights so the lack of movement does not look silly (unless you are modelling the M25 of course). 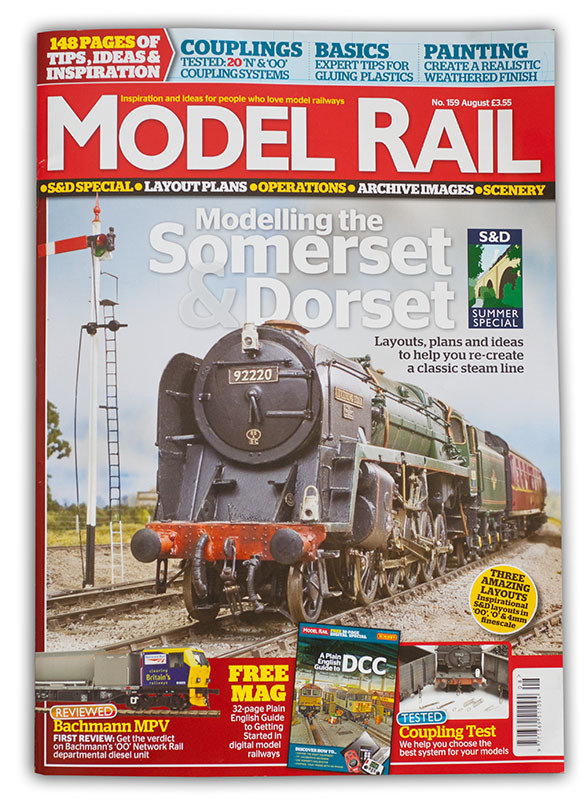 Further reading: there is of course a lot more than can be done, so much so that ace modeller George Dent and your's truly penned and article for Model Rail 156 (for back-issues tel: 0845 121 4000).